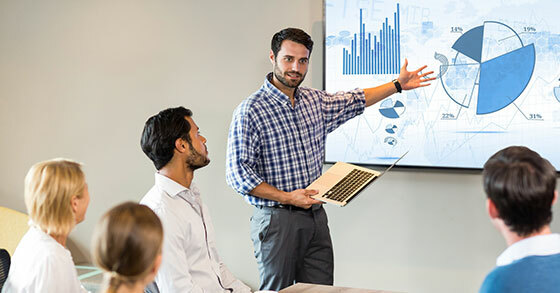 If you can master the above mentioned communication and persuasion techniques and acquire good PowerPoint presentation skills, you can grab the audience's attention. This helps you clearly communicate your message. Below are some quick tips on how to hone your PowerPoint presentation skills for better presentations. If you want to grab the attention of your audience, you need to start focusing on the points that you want to convey via your PowerPoint presentations. Start with selecting an appropriate PowerPoint presentation template, and then, make sure not to crowd the presentation slides just to look fancy. PowerPoint presentation templates are available in themes with coordinated colors, fonts and visual effects. If you are good with PowerPoint presentation design, you can create your own PowerPoint themes with your preferred fonts, colors and presentation designs. To lucidly illustrate your presentation content, use appropriate audio and video in your presentation slides. This helps you effectively convey your message by catching the attention of the audience. PowerPoint charts and graphs can make your PowerPoint presentations more engaging than bare text. However, you need to be judicious while choosing your PowerPoint charts and graphs. Make sure that the use of charts and graphs is relevant otherwise the presentation's key points will be overlooked and lost. For easy to use and creative PowerPoint presentations, utilize the slide master in your PowerPoint presentation template. It is one of the most important functions in PowerPoint presentation templates as it makes the process of adding and formatting content simple. The formatting you apply on the slide master of your selected PowerPoint presentation template will save you lots of time and effort as it automatically updates all the presentation slides used in your presentation. This also brings consistency in your PowerPoint presentations. If you intend to give presentation handouts of you PowerPoint presentations, remember that some presentations that look good on screen do not necessarily work well as presentation handouts. As such, you need to differentiate between presentation handouts and on-screen presentations, and do the necessary tweaking for different purposes. These are some of the most effective tips to make your PowerPoint presentations more effective as well as easy. And, you don't have to be a rocket scientist to figure out what works and what not to make your PowerPoint presentations work to your advantage. All it takes is, keeping these simple PowerPoint presentation tips in mind and then practice, practice and more practice.